Tales from the Real OC (Really! ): ECHO Trailer, Contests and More! My publisher just released the ECHO trailer and I’m SO excited to share it with you! Want to win a copy of ECHO!? 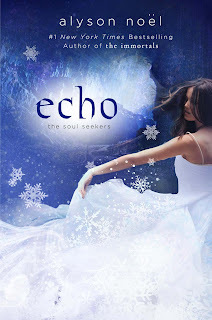 Figment is hosting several ECHO giveaways to celebrate the release of the next book in the Soul Seekers Series! 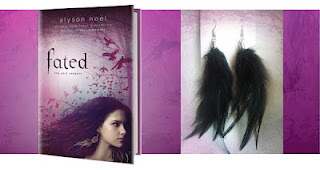 Click HERE to enter the ECHO sweepstakes for your chance to win copies of ECHO and FATED! And click HERE to submit a short story about someone who can communicate with the dead for your chance to win signed copies of FATED and ECHO and a pair of Soul Seeker–inspired feather earrings! I also wanted to share a fun TV interview I did at the Antwerp Book Fair last Friday--see it HERE!! I’m heading out for Charleston, South Carolina tomorrow and I hope to see YOU at YALL Fest on Saturday, November 10—details below! I love the video and the book cover too...I got the first book but i didnt read it cause I'm waiting for the second book but I cant wait. Alyson is it true this series is going to be a movie? if it is will those guys in the Fated video going to be part of the movie or its going to someone else, cause in Fated I see the guy with the long is perfect for Dace. whats the guy model name and sorry for all these questions but last one is that his real hair or no? Is it possible to follow this blog? I can't find a link anywhere. Hi Shari - Thanks so much! Glad you like the trailer and I hope you like the book too! I'm thrilled to share that all four books in THE SOUL SEEKERS series—FATED, ECHO, MYSTIC, & HORIZON—have been optioned for film by Cheyenne Enterprises! Sue - Hope you're enjoying the book! The art team at St. Martin's is amazing and they never cease to amaze me with their covers! The link to follow the blog is at the bottom of the right column. Thanks for your support--and hope you stop by again!